Last week the Girls’ Hockey team spent a beautiful and hot afternoon on Pisiquid Lake here in Windsor. We met up with a great non-profit organization from Wolfville called GIRLS ON BOARDS, whose mission is to “empower girls to love their bodies, trust their core and lead the way!” We spent a few hours paddle boarding and learning how to do headstands on a paddleboard in the middle of a lake. On land we had fun with some classic team-building activities! This was a great way for the girls to get to know each other and bond as a team. We are starting off on the right foot and can’t wait to hit the ice for our first game on September 28th, in Saint John, New Brunswick. We would like to thank the amazing volunteers at GIRLS ON BOARDS CO for being so awesome and taking the time to come to Windsor and teach our girls about their message and paddle boarding. We would also like to thank our team manager, Morgaine Sullivan, for organizing this great event for us! If anyone is interested in organizing or participating in a GIRLS ON BOARDS event visit their website for more information! Whether your son or daughter is a hockey fanatic or simply curious about Canada's favourite game, there's a KES team for him and her in our wonderful hockey programme. 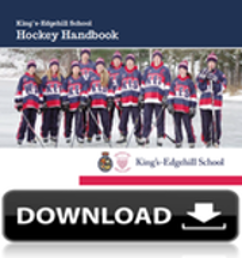 Download the KES Hockey Handbook and find out more here.